In 2005 while driving through the Owens Valley on the way back to Los Angeles from the Lake Tahoe area, I looked out the window of my car at the magnificent crest of the Sierra Nevada Mountains and had a crazy thought. Well, it wasn’t a crazy thought except that for someone like me who had never before climbed a mountain, – I thought it would be great to climb Mount Whitney. This was an idea that would stick in my head for a long time. Slowly, bit-by-bit I would start working towards the eventual goal of standing upon the tallest mountain in the lower 48 contiguous states. Read my writeup of that experience here. I started doing a number of things to prepare for this goal. I started hiking around in the local mountains of Los Angeles on well-documented trails after picking up a hiking book. I discussed the idea of the climb with a mountaineer friend who had made the trek previously. At his suggestion I eventually enrolled in the Sierra Club’s Wilderness Travel Course in winter 2010. This class really opened my eyes, teaching me important knowledge about backpacking and safety in the wilderness that gave me the confidence to proceed with the plan. We put in applications for the permit lottery that February and I physically started training for the trip. My permit request was denied, but I was later offered a spot on my mountaineer friend’s permit. Anyone who does research into the Mount Whitney trail will inevitably come across descriptions of the infamous 97 switchbacks (or 99, or is it 98?). At the high camp along the trail, Trail Camp, which sits well above the tree line at 12,000 feet, you come face to face with this section of trail and for the first time the sierra crest is within reach. For 2.2 miles, rising some 1600 feet, the trail zigzags 97 times in close quarters on a slow (some would say monotonous) trek to Trail Crest. One description I read said to be sure to bring your iPod and headphones for this section. Indeed it was seemingly endless, but when you reach Trail Crest (13,600 feet) you can finally see to the west into Sequoia National Park. Another three miles of hiking and I found myself completing the goal I had set out to do some five years earlier. On the last morning of the trip, I set my 5D2 upon a rock and shot about 12 minutes of HD video of the day’s hikers making their assault on the 97 switchbacks before we headed out. The next day, back home in Santa Monica, I sped the time lapse up and played it. I was struck by path the people outlined as they zigzagged up the mountainside. An idea dawned on me. What if I took a long exposure of this trail at night, with some lights to light up the path? The idea was intriguing to me. I had done some star trail photography before, and I knew I could find a way to make it work. I would need volunteers to help though. I talked over the idea with some of my new friends from the Sierra Club class and the project was a go. I immediately wanted to shoot this on large format film. I had a Mamiya 645 Pro camera I loved, but for this project I thought bigger. This was going to be a herculean effort to pull off at 12,000 feet and I wanted to go big and be done with it. So, my original quest involved 4×5 film. I figured this would be a pretty good tradeoff between some really enormous resolution and size and weight to carry up the trail. There was a bigger problem, however. This was December and Mount Whitney permit applications were due in February. When to shoot? What amount of moonlight? How can I take something fairly unpredictable like five-hour exposures and make them as manageable and predictable as possible? The first question I needed to try and figure out was how much moonlight would be needed to fill in the landscape. I knew the shot would be boring if you couldn’t see where the trail was traveling through. Would starlight alone be enough? I did some tests. Starlight only at the Devil’s Golf Course in Death ValleyThis first round of tests told me I would definitely need some moonlight. With the permit application deadline looming I looked at a chart of all the sunrise, sunset, moonrise and moonset data for 2011. What should I look for in this data that would allow me to scientifically test exposures before the big shoot? I looked at GPS data from my ascent and descent of the 97 switchbacks from a few months before. I saw that it took about an hour and a half to descend from Trail Crest to Trail Camp. I decided to focus on this interval. I would look for at least an hour and a half between total darkness and moonrise. This would allow the descent with a light to light up the trail, and then a variable time afterwards that I could test for to fill the landscape with a rising moon. Since the moon would rise in the East and has a fairly unobstructed path to the switchbacks, it would serve as a giant fill light in the sky. This would be a delicate balance, however, as too much moonlight would wash out the star trails in the sky above trail crest. With the target dates in mind, permit applications were sent in to the Mount Whitney Permit Lottery. You can see the dates ranked by choice for each month. With 200% snowfall the previous winter, August and September were the targets, with the moon dictating the dates. In May we received the results. We had obtained permits for the choice dates in both August and September: there was a first attempt and a backup date. Now, it was time for testing the exposure. With my demanding day job, I had to find time to get away for long weekends to do nighttime exposure tests. I needed north-south mountain ranges as test subjects so as to be as close as possible to the target range while being easily accessible for testing alone. 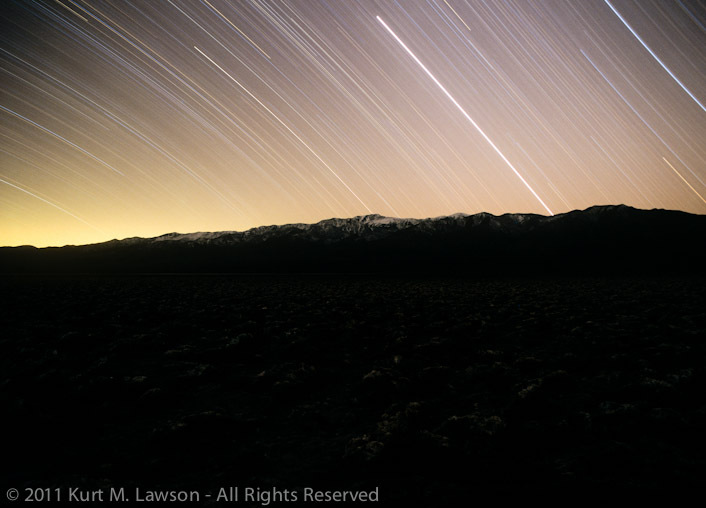 Death Valley was a great spot for this, since the north-south Panamints were not far from the Sierras and the isolation meant I could safely set up multiple cameras and not have any thought of company – human or animal – disrupting my exposures. I scrambled together as many film cameras and tripods as I could manage to test different film stocks and exposure lengths. I ended up using two Mamiya 645 Pros, a Mamiya 645J, an Olympus OM10 and an Olympus OM1N, as well as once a rental Mamiya 7II. Being initially focused on 4×5, I settled on an aperture of f/5.6 for the shot, given that most large format lenses don’t get much faster than this. All my tests were done with this aperture after my initial test shot had shown that this produced nice interesting star trails. Online I started researching 4×5 photography and I soon discovered that there were some potential issues with the film moving as the temperature changed in the camera. I would have to somehow tape the film in place. I also would have to rent the camera. Given my lack of large format experience, I became concerned that I wasn’t going to have the time to perfect technique to make it work right in time for the shoot, even though it was ultimately nine months away. I decided then the next best thing would be the largest medium format camera solution I could find. The Mamiya 7 platform became the obvious choice. Compact, lightweight 6x7cm medium format cameras with sharp lenses. If possible, I was also going to take my Canon 5D Mark II kit to take other photographs and to do a digital version of the shot as backup in case something went wrong with the film cameras. One problem I knew I could be facing was condensation. Dew. This could ruin the photo, and something had to be done to prevent it. To combat this problem, I picked up a Dew-Not. This is a little controller/heater for heating lenses and telescopes to prevent condensation. To power it, I picked up a 9600 mAh lithium ion battery pack from eBay. I tested this in Horseshoe Meadow, a place nearby in the Sierras at almost 10,000 feet. I had seven cameras. The two cameras with the Dew-Not attached had no condensation, while the other cameras fogged up and covered with moisture by the end of the exposure creating a foggy look that would be unacceptable in the final image. I picked the lithium ion battery to save weight. You really feel every pound you carry up to 12,000 feet, so that additional expense compared with NiMH batteries was a no-brainer. Over the next several months I would make several test trips to Death Valley, the Alabama Hills, Horseshoe Meadow and the White Mountains to do test shots with my array of cameras. With these tests I was able to narrow down the exposure to a target. The exposure would be five hours long starting at the end of astronomical twilight. Astronomical twilight is when there is no longer any sunshine in the sky, only starlight. The moon would then rise 2 hours later to fill in the landscape. The same camera, same lens, same film and almost same exposure were used to make the final image. Note how blue the sky is. By now I was feeling confident about the overall exposure. I had a formula that seemed to work. I had gear to prevent dew. I had the camera picked out. There was one thing that was missing. What was I going to use to light up the trail? A frantic search ensued. I scoured the Internet for the brightest, smallest lantern I could find. Would simple headlamps be enough? Would I need a super bright LED lantern or an even brighter gas lantern? These questions would haunt me in the days leading up to the actual shoot. The biggest problem I had was testing. I needed to go out and test different light sources, but none of my volunteer friends were available when I was. My erratic freelance work schedule meant people who had “real” jobs would not be able to accompany me, and there was the question of where to even do such a test. I needed somewhere on a slope where the camera was between 1500 and 5000 feet away from the light. I just wasn’t able to find an effective location, and was often too exhausted to attempt to do all of it myself late at night in Death Valley, for instance. So, I took a big gamble. One thing that was clear to me with the light was that it needed to be omni-directional. No matter where the lantern was on the trail, I needed the camera lens to see the light source directly. This would maximize the effect of streaking across the film as the bright source of light itself would be visible. Had I used just headlamps I fear I would have been at the mercy of what direction the headlamps were facing, resulting in reduced intensity when facing away. I didn’t want a dotted line. Asking around online, I read that the light of a bright star in the sky is approximately 100 lumens. The brightest LED lantern that I ended up finding was this one. This lantern weighs in at 580 lumens. 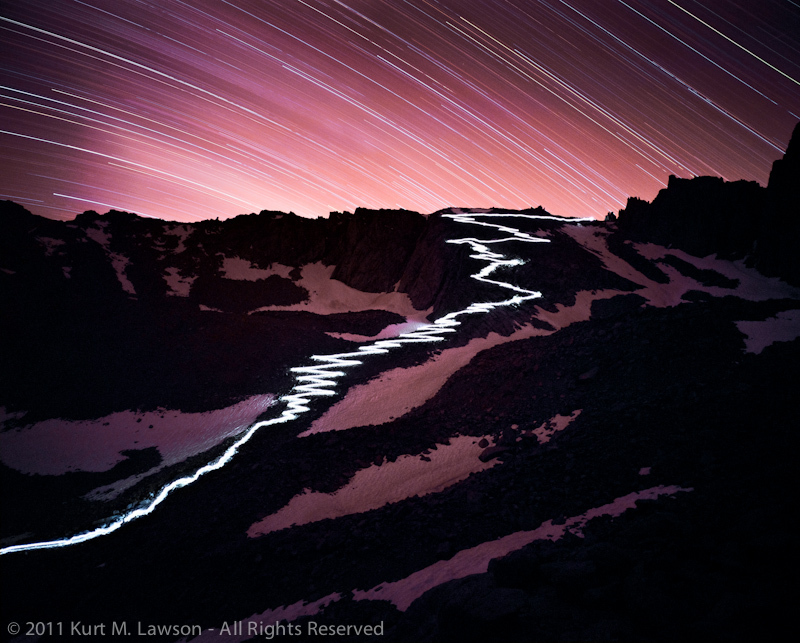 I figured a star travels slower than the people were going to be through the exposure, so the light produced by a this lantern would be enough to make a strong streak through the entire 97 switchbacks and have it read properly on film. I purchased two of them. Each requires 8 D batteries for power. This was going to be fun to carry up to the top. With all the gear figured out, there was a question of where to shoot the photo. Scouring Google Earth and any picture I could find on Flickr and Google Images, there was a clear choice for the proper field of view required. Wotan’s Throne. The summit of this nearby rock seemed to be the nearly perfect place. This posed certain problems, however. Physically it was another 750 feet or so of elevation gain involving class three rock scrambling. How could the camera be safely started and stopped in the night from there? These questions would not be resolved until the day of the shoot. For this expedition I had a lot of help from friends. In the planning of the expedition, providing advice and wrangling the team that would ultimately help me carry out the shot, friend Kim Homan was a tremendous help. She and friend Michelle Orem were the first two people to join in. Kim helped me keep things safe and provided insights that greatly helped. Brad Anderson and Michelle assisted with a scouting climb to the Trail Camp area on July 17th. Stacy Sanchez and Koichi Minamizuka volunteered to carry the lantern up and down from Trail Crest, after they had climbed to the summit of Mt. Whitney earlier in the day! Bill Becher lent his help in carrying gear and mountaineering expertise. My good friend Ben Keil helped carry gear and summited Mt. Whitney with Stacy and Koichi. A. Michael Dobbs accompanied me on one of my test exposure runs, helping to move gear to Horseshoe Meadow and back in the middle of the dark. Thanks too to Dwain Roque for providing some consultation and lending me some gas lanterns, even though I ended up going the electric route. A huge thank you again to all of you. Finally the time of the shoot arrives. Koichi and I had gone and spent some time in the White Mountains to help acclimate to the altitude a few days early. We then moved over to the Mount Whitney Portal area to meet up with the rest of the team. Our Mount Whitney Permits were three day permits, for August 20, 21 and 22. This was to allow for one day to hike to Trail Camp. On day two Koichi, Ben and Stacy would climb to the summit while the rest of us hung out exploring, acclimating or setting up for the shot. That second night we would do the shot. Day three we would pack up and hike out and have some celebratory drinks. Everyone would carry four to five pounds of gear except for me. I would carry 10-12 pounds of gear. Then disaster struck. With everyone finally assembled I began to feel ill. Despite trying to acclimate early, I began to feel sick at our camp in Whitney Portal, elevation 8300 feet. By dinnertime I couldn’t hold anything down. I continued to feel ill into the night and on through the next morning. When I got up, I decided the best thing to do was for me not to proceed up that day as planned. My crew volunteered to take gear up to Trail Camp anyway in case I felt better, and I resolved to spend some time down in the valley in the higher air pressure and then attempt to join them Sunday morning. So, I watched my crew depart without me on Saturday morning, and headed down to chill and try to feel better. Since things were uncertain, I stripped down the gear. No more 5D, only 1 tripod. Just the bare minimum gear to get The Shot was taken up. I radioed that evening I was feeling better and would be making the trek up the next morning. Alone, with a little help packing my overstuffed backpack from Brad Anderson and Val Nathan, who were getting ready to do their own assault on the East Buttress of Mt. Whitney, I headed up with my 52 pound load. Seven hours, six miles and 3700 feet of gain later I arrived triumphantly at Trail Crest and met up with the rest of the crew. After dinner, Kim, Bill and I headed up towards Wotan’s Throne and Stacy and Koichi headed up towards Trail Crest with the lantern. While they were making their ascent, we scouted out a place for me to camp and set up the photo. We climbed 265 feet up before settling on a spot where I could set up the cameras and sleep nearby, allowing for an unobstructed view of all 97 switchbacks. Kim and Bill helped me set up camp and secure the tripod with rocks and tie lines and then they headed back to camp below. I was alone with my gear and my brave friends were climbing the switchbacks for a second time this day. Two Mamiya 7II cameras with 43mm lenses were used. My Gitzo GT3531s tripod was tied down with a bag of rocks and tie lines to secure it against the wind. More tie lines and zip ties anchored a Gorillapod Focus with the second Mamiya 7II off the side of the Gitzo. Cloth generic cable releases taped down with duct tape provided shutter control. The Dew-Not heater was installed and engaged with the Lithium Ion battery. Checking my phone, I pulled up The Photographer’s Ephemeris to check actual astronomical data for my location. I had roughly planned start and stop times ahead of time, but that was using military data from nearby Lone Pine. At 9pm, I opened the shutter. Shortly afterwards, Koichi and Stacy turned on the lantern at Trail Crest. Instantly I knew the streaking trail through the switchbacks would be ok. The lantern was bright! At this point I was not feeling well again. My stomach was in extreme knots. I was dry heaving. I couldn’t do much other than watch the light and feel ill. After about 45 minutes of watching the lantern I had to lie down in my tent to keep warm and try to relax. Every 15 minutes I would peek out at the light to check on my friends. Their radio had failed so I couldn’t talk to them. After about two hours they had made it back to Trail Camp. I watched them arrive down there and then chatted briefly when they got a hold of one of the other radios. I passed out until 1:00 am when I awoke to check on the cameras. I peered out and clouds had started to roll in. I had planned to keep the exposure open a bit longer, but closed the shutters a little early about 1/2 hour later for fear that the clouds would wash out the star trails. I turned off the dew-not heaters and attempted to sleep. I did not sleep well. The next morning I got up to a spectacular scene. The light was fantastic. I found myself really wishing I had my 5D2 with me. I snapped away with my Canon s95 pocket camera. I awaited rescue from Bill and Kim who arrived to help me pack out from my solitary camp. I was feeling much better. Things look a lot different in the morning alepnglow. Can you even make out one of the switchbacks here?The trek down was uneventful. I was filled with relief and anxiety. We had done it. But, with film we would not know the results until I got the it back from the lab. Back at the Whitney Portal Store we all had a burger and a beer in triumph, and then broke apart for our respective drives back home. Tuesday at noon I had the film back. The lantern path was a success. A pure white streak outlined the switchbacks. The rest of the image was pretty dark, however, darker than expected. I raced home to scan it immediately. I put the film into my Nikon LS9000ED and checked it out. It looked like it could be amazing, but the first image was a bit blurry. I was concerned. I scanned the second exposure. The first one had been the one on the Gorillapod. The second was the one on the Gitzo directly. It was sharp. I was relieved! It looked great, however the path itself looked like it had flared the lens. I sent the film off to get professionally drum scanned at James Beck Digital. This new scan blew me away. The shadow areas were more filled in and the strange flared halo from the trail was gone. At last, it was complete. Months of planning had paid off. A herculean effort from my team had helped me achieve the image I sought to achieve. The color was a surprise. My other tests had produced more blue, but the result is striking. I love it. Compare with the daylight picture the next morning just above. Once more I have to say thank you to my friends who volunteered time to help out on this quest. It was a fun adventure, and I think the result speaks for itself. Xingyuan Wang - When I first saw the photo, I thought to myself that this must have been on a road somewhere, given the intensity of the light trail. It didn’t occur to me until later that given the composition, the turns would have been far too tight for this to be the trail of a car’s headlights, and my curiosity was piqued. This is an awesome testament to what pure photography is all about — in my mind, anyhow. The proliferation of cameras means that there are a lot of common pictures out there, and I wonder sometimes what professionals (I’m still a snapshooter; I’ll be honest, so I’m contributing to the problem!) are going to do in the future. What you’ve done is really, really impressive, and I’m glad you shared the story not because now I want to go out and duplicate it but because it showcases how much preparation and knowledge of the environment goes into a given shoot. Making pictures isn’t always about pointing a camera and hoping it gets the shot; there’s careful planning of the seasonality of an area, there’s physical training, there’s weather considerations… and you’ve managed to capture that all in this post and picture. A very hearty congratulations on the shot! I’m not sure if you have any regrets — “Oh, I wish I could have done this” or “I should have done it that way” — but from my eyes, the dream culminated in a tremendous result and the preparation more than paid off! PS: did I read right: this was a *five* hour exposure? Is low-ISO film really that noiseless? Kurt - Thanks Xing. It ended up being 4.5 hours long, and yes film doesn’t get that much more noisy with such long exposures, unlike digital cameras. In this case most of the film was fairly underexposed, so the grain is most certainly very present. At this size on the internet you don’t see it, and with 6x7cm film the resolution is quite massive which helps mitigate the grain. Sharon - This is so impressive and inspiring, Kurt. I admire the vision and dedication it took to make this gorgeous photograph. How immensely gratifying to realize the spectacular, successful, creative product, coalesce from planning, assistance, effort, and vision. Kudos to you and every one of your assistance; and thank you for the documentation, the story behind this shot. Jim White - Amazing photo. The story of how it was produced shows that great accomishments take planning, effort, and perseverance. That set of switchbacks is loved and hated by many Whitney hikers. I think you will find a good market for prints. Christopher - ahh, very exciting to read! I´m very impressed by the effort you have taken for the photo. And in the end it has obviously worth the time. I would be very interested in a further blog post about your testing and experiments while preparing for this shot (reciprocity failure test, film brand comparison, various experiences and hints). Sue Sells - Hi Kurt, Your photography is awesome! I met your mom last weekend and she told me to check out your site. I am very impressed. Today and several other times recently people have been coming into the LP visitor center and mentioned missing your photo. jayp - this is so awesome and inspiring. thanks for taking the time to write this. Julie Calvo Fergus - Absolutely stunning. I loved reading about all the work that went into getting this shot. I’m planning my first summit attempt on June 20th. Your photo and the collaborative effort is inspiring, as is your story of your own first summit. Thanks for sharing.